The 96-year-old great-grandmother from Kerala, the oldest to take a literacy test in the state, who scored 98 out of 100, has started to learn the computer. After being felicitated by Kerala Chief Minister Pinarayi Vijayan, she had expressed her wish to learn how to operate a computer in her ‘free time’. Kerala Education Minister Professor C Raveendranath gifted Karthayani Amma a laptop on Diwali and helped her type her name. The grandmother smiled during the process. The nonagenarian says she has no medical illness and is full of enthusiasm. 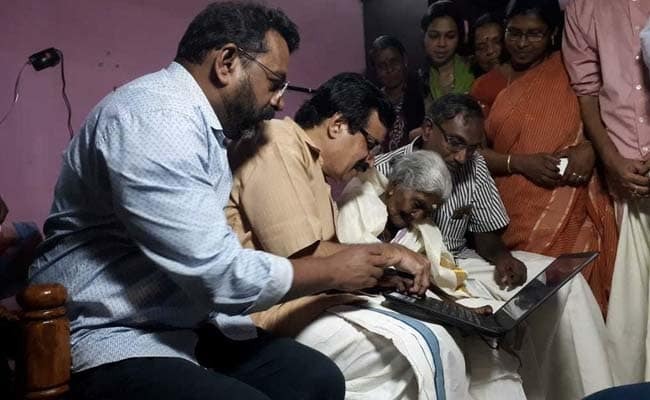 Her daughter, who is in her 60s, also cleared the literacy exam recently.Karthayani Amma got a laptop from the Kerala government on Wednesday. Karthyayni Amma wants to finish her Class 10 equivalent exam as part of the Kerala State Literacy Mission, which aims at attaining 100 percent literacy. The literacy programme tests reading, writing and basic mathematical skills. This year approximately 42,933 candidates cleared the test, taking the state closer to its aim of 100 percent literacy. In 1991, Kerala was declared fully literate, which means attaining 90 percent literacy, as per the UNESCO norms. Even though Kerala is the flag bearer of literacy in the country, around 18 lakh still remained illiterate according to the 2011 Census. This prompted the state government to launch the “Aksharalaksham” programme on January 26. The motto of the programme is to eradicate illiteracy among marginalized communities like tribals, poor fishermen and slum-dwellers. Be the first to comment on "Malayali grandma learns to operate the computer, after topping literacy test"